Ice Age was released in June 1995, heralding in a new kind of core set for Magic: The Gathering, a stand alone core set. Ice Age was introduced to be played with the other sets but could also be played completely unto itself, since it had the inclusion of the five base lands; Forests, Islands, Mountains, Plains and Swamps. Because it was a stand alone set, it was the first non-core set to include the basic lands and be sold in Booster packs and Starter packs. It was comprised of 383 cards, which included the five basic lands, 26 reprints from Fourth Edition, one reprint from Unlimited and ten functional reprints, which are cards that do the same thing as existing cards, but have another name. The set compilation was 45 Artifacts, 56 Black cards, 56 Blue cards, 56 Green cards, 56 Red cards, 56 White cards, 25 Gold or Multicolored cards and 33 Lands. The rarity breakdown was as even keeled as Fourth Edition with 20 Land, 121 Commons, 121 Uncommons and 121 Rares. 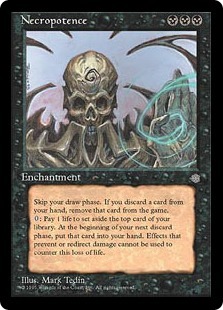 Unlike in Fourth Edition, none of the reprinted cards had their rarity changed. 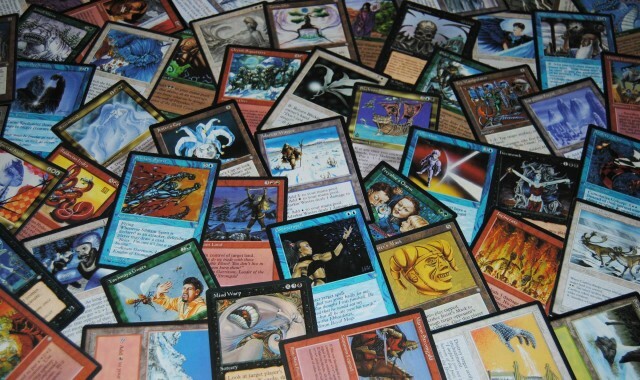 Ice Age brought back the Gold or Multicolored cards, which hadn’t been printed in a set since Legends in June of 1994. Ice Age also added Cumulative Upkeep and Snow-Covered Lands. Cumulative Upkeep gave rise to the idea of using cards to switch ownership, putting the onus of the upkeep to your opponent. Snow-Covered Lands were just that, each of the five Basic Lands had a snow-covered version, which still only gave you one Mana of that color (a Snow-Covered Mountain just produced one Red Mana as does a regular Mountain), but it gave way to things like “Snow-Covered Mountainwalk” and other such things revolving around Snow-Covered Lands. Where, Fallen Empires gave rise to names and races such as Tourach, Icatian and Thelon, Ice Age gave rise to Balduvian, Fyndhorn, Kjeldoran, Krovikan and Lim-Dûl. 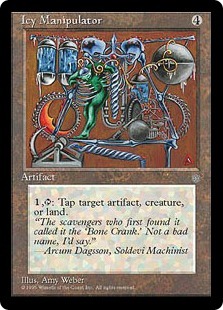 As with future sets, Ice Age would add some power cards to the game of Magic: The Gathering, such as Necropotence, Enduring Renewal, Tinder Wall, and Zuran Orb to name a few. As mentioned before, there were 26 reprints from Fourth Edition, one reprint from Unlimited and ten functional reprints. There isn’t much to say about the 26 reprints from Fourth Edition, as they are just the basic color standards, Circle of Protections, Giant Growth, Counterspell, Disenchant, Shatter, etc, but the reprint from Unlimited was celebrated as it was the return of the Icy Manipulator. 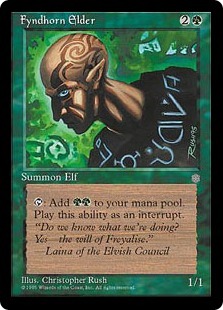 There were also ten functional reprints, which is to say that in an existing set (at that time) was a card that does the same thing but with a different name; Fyndhorn Elves is just a renamed Llanowar Elves, Zuran Spellcaster is a renamed Prodigal Sorcerer, Tor Giant is a renamed Hill Giant, etc. 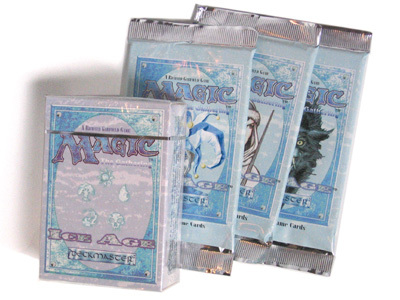 The functional reprints in addition to the 27 other reprints were an attempt by Wizards of the Coast to make Ice Age a stand alone set and, at least, at that time, they succeeded. Ice Age only tournaments could have decks just as powerful as others and were not weakened by the limitation to just Ice Age cards. Granted the decks were different, but they were not weaker. Aside from the Basic Lands and aforementioned Snow-Covered Lands, Ice Age gave rise to the rebirth of Dual Lands, although they weren’t straight up Dual Lands that were in Revised Edition; there were Pain Lands and Slow Lands. Both types numbered 10, one for each combination of colored Mana. The Pain Lands were the most used of the two types. They allowed you to tap for one colorless Mana without any pain at all, but if you were to tap it for either color of colored Mana, it dealt one damage to you. The Slow Lands, were just that. If you used them this turn, they would not be available next turn. So it’s no surprise that people were more willing to give up some damage for Mana, instead of not having that Mana available to them next turn. 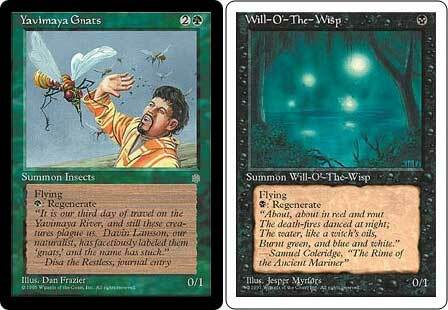 There were also three non-Mana producing Lands included in the Ice Age set; Glacial Chasm, halls of Mist and Ice Floe. Glacial Chasm had an enormous upkeep; “Cumulative Upkeep – Pay 2 Life,” for which you couldn’t attack but had a safe barrier between you and damage as it said, “Prevent all damage that would be dealt to you.” Of course, you’d still have to deal with Glacial Chasm itself hitting you every turn. The halls of Mist, also had a Cumulative Upkeep, although more reasonable at just one colorless Mana and would prevent creatures from attacking two turns in a row. 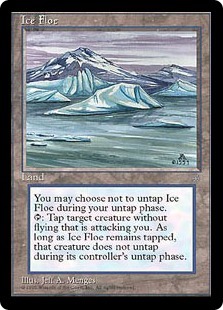 Still, the most useful of the non-Mana producing lands was Ice Floe. Ice Floe states, “TAP: Tap target creature without flying that is attacking you. 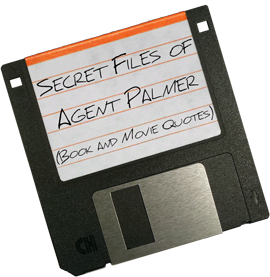 As long as Ice Floe remains tapped, that creature does not untap during its controller’s untap phase.” This gave you the option of nullifying a creature after its first attack and was a great safety measure until the creature could be dealt with otherwise. Within the color Black Ice Age had some powerful additions; Necropotence, Pox and huge creatures, as well as, sources of mass Mana. 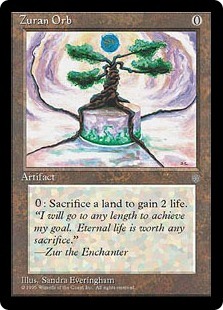 The Mana production was from Burnt Offering, by sacrificing a creature, and Song of the Damned, by adding Black Mana based on the number of creatures in your graveyard, both cost one Black Mana and could be used efficiently to get more Mana from one spell than a Dark Ritual, which was also reprinted in Ice Age. The big and or powerful creatures were Infernal Denizen, Krovikan Vampire, Minion of Leshrac and Minion of Tevesh Szat. All of which had fairly high casting costs, but could be put to great uses late in games. The “Hippy,” or hypnotic Specter from Fourth Edition, was given a partner in crime in Ice Age with Abyssal Specter and discard decks were furthered by Mind Warp and expensive version of Mind Twist from Fourth Edition. The idea of using your land to deal damage is not a new concept, but Ice Age’s hecatomb took it to a new level. You have to sacrifice four creatures when you cast it, but it turns every one of you swamps into a “Tim” (or Prodigal Sorcerer). The only downside was that, all of the damage came from hecatomb and not from the swamp, so it could be easily prevented with a Circle of Protection. Demonic Consultation was a very interesting sort of Demonic Tutor. The Demonic Tutor was too powerful, so they put Consultation in print, in it’s place, which allowed you to deck yourself for the card you’re looking for, it could be useful, but to get your hands on a card fast, nothing was better, than arguably the power card from Ice Age in Black; Necropotence. It needed to be played at the right time, not to be a suicide, but Necropotence, even with it’s nothing goes to the graveyard and pay one life to draw a card was the pinnacle of deck building in Ice Age. There were plenty of combinations, specifically with Enduring Renewal, also from Ice Age. The effect of Necropotence on deck building was that it gained a brand new life with Enduring Renewal when Goblin Bombardment was released in Tempest. That three card combo, known as Cocoa Pebbles, would do some powerful things. One interesting Black card, because of it’s art, was Leshrac’s Rite. It’s art featured the famous sack-doll that was on Black Vice, The Rack and Cursed Rack, as well as a few others cards. It was nice to see one character, remain throughout the game, in this new set. The important things about Blue in Ice Age is that it retained Counterspell and Power Sink, as well as, being able to match the large flyers in other colors and sets with Sibilant Spirit. Blue in Ice Age also contained more useful cantrips than any of the other colors, so with the right cards, you could draw much faster than your opponent. 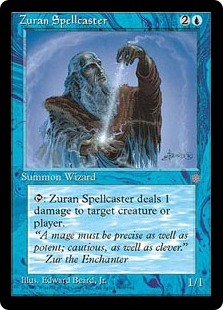 Of course everyone was happy to see a “Tim” in Ice Age with the Zuran Spellcaster as a functional reprint of Prodigal Sorcerer. Brainstorm the extremely light Ancestral Recall was immediately put into Blue decks, as the closest thing to Recall we’d ever expect to see. Iceberg was an interesting card, in that it was very much an enchantment that was similar to Sand Silos from Fallen Empires, only you could put more Mana back on it faster. And access to a lot of Mana would be required for some of the goodies delivered to Blue in Ice Age. Binding Grasp, the torchbearer for Control Magic, boosted the stolen creature’s toughness with +0/+1, but had an upkeep or the stolen creature goes back to it’s original owner. Deflection, another addition to the stable of Blue control cards, had a casting cost of four but allowed you to change the target of a spell. Still, the real Mana was being spent on cumulative upkeep for things like Illusionary Forces, Illusionary Presence, Illusionary Terrain, Illusionary Wall, Reality Twist, Polar Kraken and Illusions of Grandeur. The last three really added to Blue’s arsenal and concept of control. Reality Twist, although it had a three Mana cumulative upkeep, was a great way to temporarily disable Mana production for a turn or three after which the upkeep was excessive. If you could Boomerang it back to your hand, you could really control the Mana production of the game for even more turns, allowing your deck to do what it does best and in Blue, that’s control. Of course, it didn’t work as well against Green as it did not affect their Mana producing creatures. 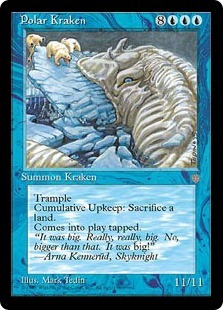 Polar Kraken’s use as a big creature was beyond compare as an 11/11 trample. 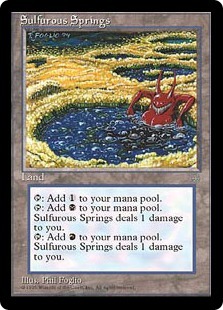 Even though it had one of the most expensive cumulative upkeeps in the game at “Sacrifice a land” and came into play tapped, it was in conjunction with other cards that it was most powerful. In combination with Burnt Offering and Animate Dead or Dance of the Dead, if you could get it into your graveyard quick enough, it was a huge source of Mana for Drain Life or Soul Burn. Illusions of Grandeur was the first big switch card. The idea being that you would gain the 20 life and then give it to your opponent, so when they couldn’t pay they upkeep, they would lose 20 life and essentially the game. Of course, it wasn’t all big spells, big upkeep, and big creatures with blue. Magus of the Unseen and Mystic Remora were extremely helpful and cheap. Magus of the Unseen was a way to gain control of an artifact and in combination with Icy Manipulator you could gain control of any artifact you should choose. Mystic Remora was wonderful for a short period of time. As a first turn play, you would only have to pay its upkeep for a turn or two and you’d gain an extra draw or two, as well. It may seem ridiculous, but Green got faster in Ice Age. 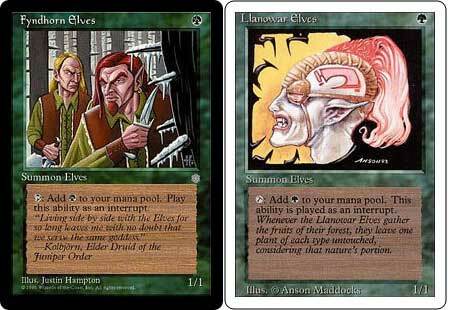 As a stand alone set it was nice to see the Fyndhorn Elves, a functional reprint of Llanowar Elves, but there was also Fyndhorn Elder, which cost more, but gave you two Green Mana when tapped. Rime Druid a one Green Mana casting cost 1/2, or the anti-Savannah Lions, was also a huge boost to speed for green as was Tarpan, a cheap 1/1 that gave you a life and Tinder Wall. Green also had some big creatures in Ice Age as well, Scaled Wurm, Johtull Wurm, Shambling Strider, Wiitigo, Lhurgoyf and the small but extremely useful Yavimaya Gnats. It wasn’t all about creatures or at least their powers. Thermokarst was a straight up green Stone Rain and Elder Druid was an Icy Manipulator in creature form. Forgotten Lore was similar to Regrowth from Revised Edition and with Green’s Mana production, you would more often than not get the card you were looking for. Scaled Wurm was the core set replacement of Craw Wurm, and although it cost two more Mana, was a 7/6 as opposed to it’s Fourth Edition counterpart which was a mere 6/4. Wiitigo was a 6/6, Juggernaut of sorts but better, because if it attacked or blocked it gained a +1/+1 counter, otherwise it lost a counter, talk about use it or lose it. So yes, there were the base Mana producing elves, Fyndhorn Elves and Elder, but the fast Mana for Green came from Tinder Wall, which changed the way Green/Red decks were build forever. 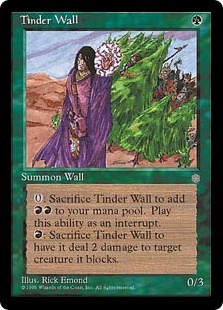 Green was always fast at producing Mana, but Tinder Wall was a Wall of Wood that could be sacrificed for two Red Mana! Once Alliances was printed, Tinder Wall in conjunction with Elvish Spirit Guide and a few select cards gave rise to the “First Turn Shivan” deck. The hallmark of big Green creatures from Ice Age was the Lhurgoyf. A */1+*, where * was equal to the number of creature cards in all graveyards. This was best used in a Green/White deck when cast after a Wrath of God, where you’d see a 20/21 or more Lhurgoyf as the only creature in play. It’s a good thing Lhugoyf wasn’t printed with trample, or it would have eventually been restricted or even banned. Green wasn’t all about the Mana producers or big creatures, it had it’s own version of Will-o’-the-Wisp in Yavimaya Gnats. Granted the Gnats cost more, but this is Green we are talking about so, it was usually cast on turn two anyway. This card gave Green an easy defense against the big flyers that gave it fits in the past. The color Red had some huge creature additions in Ice Age, Balduvian hydra, Chaos Lord, Goblin Mutant – an an Orgg wannabe and Marton Stromgald, but it also added some powerful spells such as Battle Frenzy, Pyroclasm, Jokulhaups, Conquer, Game of Chaos, Dwarven Armory and Incinerate. 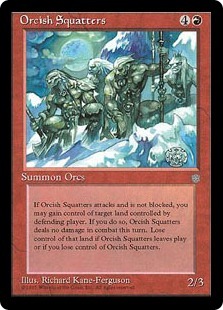 It wasn’t all about big creatures, Orcish Lumberjack and Orcish Squatters were widely used, as extremely useful creatures that could really assist you and hurt your opponent. Incinerate was the evolution of Lightning Bolt being too powerful at just one Red Mana. So they made it cost two and added that “no creature damaged by Incinerate can regenerate this turn.” Although this is great for removing those pesky Will-o’-the-Wisps and Yavimaya Gnats, due to it’s cost, I still maintain that it is inferior to Lightning Bolt and with just cause. 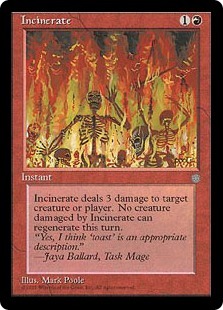 Incinerate would go on to replace the powerful Bolt in future core sets. Red/Green decks were not only sped up by Tinder Wall, but by Orcish Lumberjack, as well. The Lumberjack allowed you to sacrifice a Forest for “three mana in any combination of red and/or green mana.” Shivan Dragon, and many other future big Red creatures, would be cast much sooner in Red/Green decks thanks to this 1/1 Orc, making it a target for opponents, so as to try and slow down your amassing a huge army of big creatures. If you wanted to, you could also steal your opponents lands with Conquer or Orcish Squatters. Conquer was simple, just a straight up, “You control enchanted land,” where as Orcish Squatters, if played at the right time, could allow you to steal all of your opponent’s land, one by one. The Squatters gave rise to the Squatageddon deck, where in combination with a well-timed Wrath of God and Armageddon, you could control your opponent’s land and the game. Game of Chaos was the ultimate in gambling. “Flip a coin; target opponent calls heads or tails while coin is in the air. 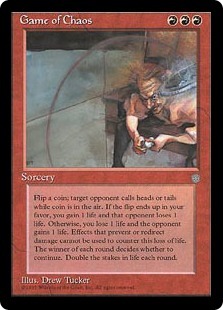 If the flip ends up in your favor, you gain 1 life and that opponent loses 1 life. Otherwise, you lose 1 life and the opponent gains 1 life. Effects that prevent or redirect damage cannot be used to counter this loss of life. The winner of each round decides whether to continue. Double the stakes each round.” The other fun thing about Game of Chaos was that your opponents Circle of Protection could not be used, so if you were feeling lucky, you could really do some damage. Eight years later, when Mirrodin was released one card made Game of Chaos even more of a sure bet, Krark’s Thumb; which states, “if you would flip a coin, instead flip two coins and ignore one.” Such a wonderful way to win a game, flipping a coin all the way. White’s contributions to Ice Age was very powerful in conjunction with other cards, but that doesn’t mean White as a stand alone color in Ice Age was a slouch, either. Enduring Renewal and Blinking Spirit were great for combos, but Call to Arms, Caribou Range, General Jarkeld and Seraph were great on their own and Justice, Drought and Order of the Sacred Torch were a blessing for sideboards everywhere. 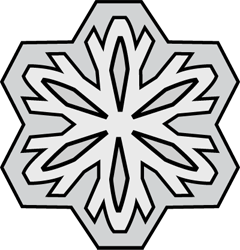 In addition to the reprinted Circle of Protections, Ice Age’s contribution to White as a counter to other colors was the Scarab. Black, Blue, Green, Red and White Scarabs all did the same thing. As long as any opponent controlled any card of the correlating colored Scarab, target creature received +2/+2 and could not be blocked by creatures of that color. Where as Drought was a great sideboard for Black and Justice was great for Red, the ultimate in anti-Black was Order of the Sacred Torch. “TAP: Pay 1 life to destroy target black spell,” simple and highly effective, just make sure to keep it alive as it was just a mere 2/2. Blinking Spirit, during Ice Age’s height could have been voted one of the most annoying creatures ever! 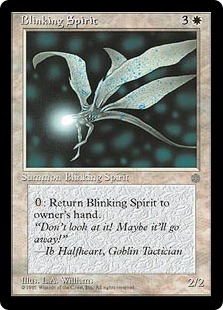 For no cost, at all, you could “Return Blinking Spirit to owner’s hand,” making it great for a combination with Wrath of God and next to impossible to kill with an Incinerate or steal with a Binding Grasp. 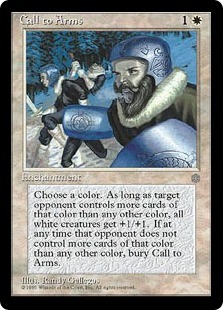 White also was given a Crusade, of sorts in Ice Age, by the name of Call to Arms. Choose a color and as long as opponent controls more cards of that color than any other, all White creatures get +1/+1. The downside to this, was the same as it was for Crusade, it’s all White creatures, not just your White creatures. Still, if your opponent is playing a single color that isn’t White, this is a huge advantage and your annoying Blinking Spirit is now a 3/3. The Seraph was an expensive 4/4 flyer that would allow you to take control of anything it hit that died the turn it was damaged by Seraph. While General Jarkeld allowed you to “switch the blocking creatures of two target attacking creatures” and Caribou Range allowed you to amass 0/1 creatures that could be sacrifice for one life each, they were not even close the cream of the crop for White in Ice Age. The top of the heap and pinnacle of White cards in Ice Age was Enduring Renewal. Enduring Renewal was so fascinating when it was released with Ice Age that deck builders couldn’t wait to start working with all the possibilities. In conjunction with Necropotence, which didn’t allow you to draw cards, but merely put them into your hand, you could still get new creatures and put them into play. Throw in a Wrath of God and Library of Leng and you can wipe the slate clean, without loosing anything yourself. But the real combo for which these two seemed destined wasn’t revealed until two years later when Goblin Bombardment was released with Tempest. Add in a zero casting cost creature, Ornithopter or Shield Sphere, and you have a deadly combo, aptly titled Cocoa Pebbles. There were other combinations as well, but Cocoa Pebbles was the most famous. For the first time since Legends, Multicolored or Gold cards made their return to Magic: The Gathering. Ice Age contained 25 such cards and although some may be more costly than others, all were useful in their own way. 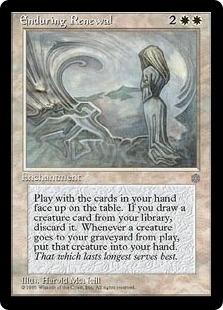 Glaciers was the ultimate in anti-Red for a minimal upkeep it turned all Mountains into Plains. Ghostly Flame was the best answer to Circle of Protection Red and Black there would ever be, rendering all Red and Black permanents and spells colorless. There were gold creatures as well, Merieke Ri Berit, the legend, allowed you to “gain control of target creature,” but the the most widely used and celebrated gold legend from Ice Age was Skeleton Ship. 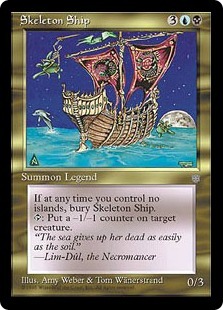 Skeleton Ship, had was is now referred to as Islandhome, but this 0/3 was best used for it’s ability, “TAP: Put a -1/-1 counter on target creature.” Slowly, but surely, you could wittle away an army of 1/1 weenies or shrink a big creature down to size. Diabolic Vision was one of the better gold sorceries, which allowed you to “Look at the top five cards of your library and put one of them into your hand. Put the remaining four on top of your library in any order.” For just one Black and one Blue Mana, this was a great early play, to set up your draw, if you had the required Mana. 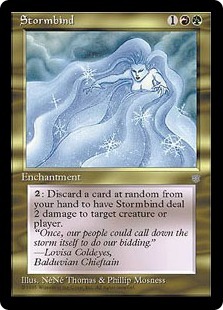 One of the more interesting and aggressive enchantments in the game came from Ice Age; Stormbind. Stormbind allowed you to pay two colorless Mana to discard a card at random from your hand, to deal two damage to a creature or player. The kicker is that it is a Red/Green card and with Tinder Wall, Fyndhorn Elves, Elder and the other Mana producing options of Red and Green, you could sit there on turn six with a handful of Land, just discarding away. Ice Age gave it’s best to all decks of any color in the form of powerful Artifacts: Jester’s Cap and Mask, Zuran Orb, the return of Icy Manipulator, Naked Singularity and many others. 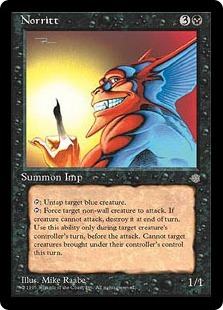 Amulet of Quoz was one of the last ante cards produced for the game, which had gotten away from playing games for ante. Arcum’s Weathervane and Arcum’s Sleigh made use of Snow-covered Lands while Arcum’s Whistle allowed you to have a Norritt that destroyed the target creature at end of turn, unless the casting cost was paid. 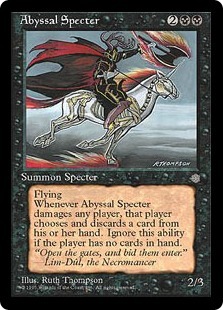 Despotic Scepter was a great way to destroy something you owned if you needed to and Urza’s Bauble was a zero casting cost cantrip to see a random card in your opponent’s hand. Crown of the Ages allowed you to change the target of an enchantment, Jeweled Amulet allowed you to stockpile Mana much more efficiently than with a Mana Battery, and Runed Arch would allow any massive weenie army to get some of it’s creatures through unblocked. Time Bomb was a ticking Hurricane and Earthquake in one, as it hit all creatures regardless of flying ability and players. Staff of the Ages rendered landwalking useless, and Vexing Arcanix was a quick addition to all Millstone decks. But the power of Ice Age Artifacts was from Jester’s Cap, Jester’s Mask, Icy Manipulator and Zuran Orb. 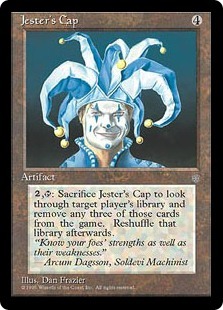 Jester’s Cap and Mask was pure control, not just for Blue but, for any color deck. The Cap allowed you to remove three cards from your opponents deck and the Mask allowed you to give your opponent a new hand, all land, no land, all things too expensive for them to cast, it’s your call. The return of Icy Manipulator was a boon for Fourth Edition’s Royal Assassin, as it had it’s combo back, and the ability to tap and render Meekstone’s or Winter Orb’s effect nullified for your untap phase was widely used. But still, the most powerful Artifact of Ice Age was the Zuran Orb, restricted the very moment it came into print. Zuran Orb was very powerful because of it’s cost and activation cost; zero, that’s right, absolutely nothing. It cost nothing to put out and had no activation cost, so once out, you could wait until you needed to and sacrifice any Land for two life. 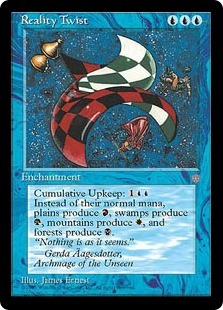 It belongs in the category of the Power Nine, with the noted exception that is was an Uncommon and not a Rare. But for power alone and use, it was at times, more handy than any Mox could be. Ice Age was very unique when it first appeared in print back in the Summer of 1995, but it was very much a sign of things to come. Mirage, Tempest, and a multitude of sets that have come since, have all been modeled in the mold that was set forth by Ice Age. The cards in Ice Age that replaced, either temporarily or permanently, their counterparts from previous sets are arguable inferior, see Incinerate vs. Lightning Bolt or Binding Grasp vs. Control Magic, still there were pluses to them, too. Wizards of the Coast wasn’t done using Ice Age for a mold of sets to come, it would eventually have a supplemental set, Alliances, which would also later be copied for Mirage and Visions, Tempest and Stronghold and many other set blocks in the future. Ice Age was the start of the “set block” and although it wasn’t perfect, the first of anything usually isn’t. This set, and the cards within it, has had a very lasting impression on the game as a whole and Magic: The Gathering hasn’t been the same since. Sweet article. I bought my very first starter pack in a small city in Minnesota. I loved that the non-basic cards were snow covered. Made for a personal experience in my opinion. 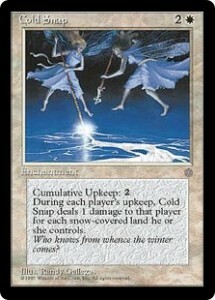 Not the most popular expansion in MTG, but it was my first and I consider Ice Age to be my gateway to the game. Let’s finish this up now, someone is waiting for you on that. Sharing little joys offer great hope to others.